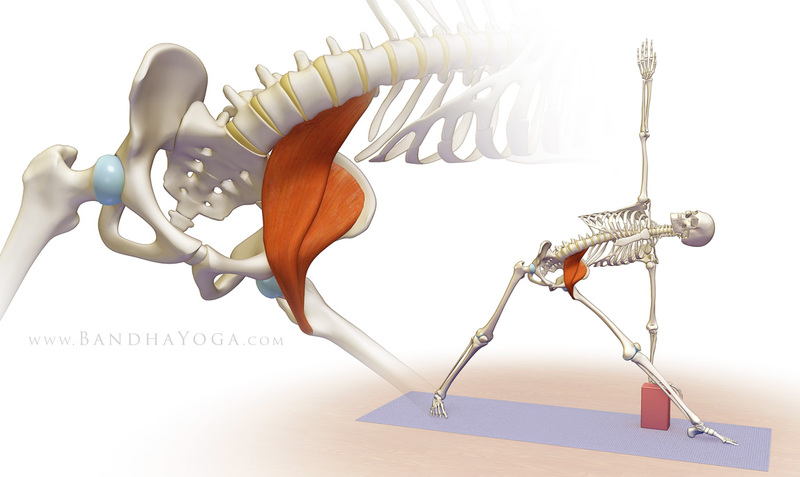 The psoas major muscle (pronounced “so-as”) is often referred to as the deepest core, or as yoga therapist and film-maker Danielle Olson states, the “muscle of the soul.” This core-stabilizing muscle located near the hip bone affects mobility, structural balance, joint function, flexibility, and much more. In addition to its function to help keep the body upright and moving, the psoas is believed to allow you to connect with the present moment especially when it is stretched out and tension is released from the body. This means that there is a lot more to the psoas than one might initially think. It is entirely possible to harness healing pranic energy and improve mental health by keeping the psoas healthy. The psoas is the principal muscle associated with physical stability. It stretches from the legs to the spine and is the only muscle connecting the legs to the spinal column. The muscle flares out from the T12 vertebrae, follows down the five lumbar vertebrae, before attaching to the top of the thigh bone. In addition to connecting the legs and spine, the psoas is connected to the diaphragm. Breathing is modulated at the diaphragm, and it is also the location where many physical symptoms associated with fear and anxiety manifest. Koch believes that this is due to the direct link between the psoas and the most ancient part of our brain stem and spinal cord, called the reptilian brain. The way we live today, constantly rushing, competing and achieving, has the psoas in a constant “fight or flight” state. The physical body is not the only part of you that suffers from a chronically-stressed psoas. 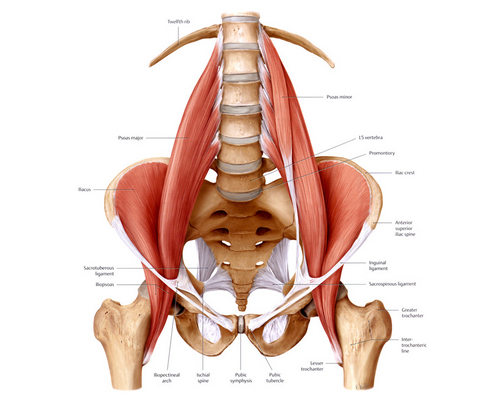 The psoas is much more than a muscle used for structural stability. It influences every element of life, from how you feel, to how you look at the world, and even how you treat others. A variety of problems have been associated with a chronically-stressed psoas muscle: it can negatively affect your emotional state; it can impact your interpersonal relationships; and it can influence your general contentment with life. Awareness that a healthy psoas is important to emotional wellness, as well as physical health, is the first step towards ensuring that we give this muscle the attention it deserves. It is an emotion that manifests itself in the most unusual ways and can “lock” itself into the body resulting in both physical and emotional tension. By restoring balance to your psoas muscles, you are likely to release this pent up tension, which can have a profound effect on releasing unfounded fearfulness about life, and thus improve both your physical and mental wellbeing. You will feel a greater sense of inner peace, along with fewer muscle aches and strains. Lengthening and releasing your psoas grounds you to the Earth, which is filled with healing and revitalizing energy, thus allowing you to balance your pranic energy and enabling you to feel more present in the moment. Proper structural stability attributed to a healthy psoas allows prana to flow, unimpeded, throughout the body, allowing for proper distribution of vital energy. In the physical sense, when the body can properly support itself, movement is less-restricted and requires less effort, thus leaving you more energetic. Our understanding of the psoas is by no means new knowledge. In fact, it is more akin to ancient wisdom that was either lost or discarded over time. Yoga shows us explicitly that ancient gurus understood the importance of releasing contracted psoas muscles. Ancient yoga asanas, or postures, that are now practiced all around the world, focus on lengthening and releasing psoas muscles and restoring comfort and balance to the entire body. With consistent practice, you can learn how to isolate this muscle, which can be immensely useful and healing in the long run. Yoga is also a great way to measure the current health of the psoas. There are many postures, such as tree (Vrksasana), which cannot be properly achieved if the psoas is contracted. If you are practicing a sitting or standing yoga pose and feel strain in either your knees or lower back (or both), then there’s a good chance that your psoas is constricted and needs more of your attention. Makes so much sense! That is where I get pain in behind the hip bones when stressed or upset or just unhappy or should I say not fulfilled emotionally personally!